A genuine California local, Trina Turk is inspired by the Golden State’s multicultural mix, creativity, craftsmanship, architecture, and landscape — a synergy that permeates her contemporary, colorful aesthetic. Infused with bold signature prints and dynamic hues unique to each collection, Trina’s modern and optimistic outlook melds the best of classic American design with a California confidence, incorporating beautiful fabrications and impeccable quality for effortless élan and carefree glamour. Founded in 1995 by Trina and her husband, Jonathan Skow, as a women’s contemporary clothing line, Trina Turk has evolved into an iconic lifestyle brand, celebrating California style with 11 annual collections of chic women’s ready-to-wear and accessories, plus swimwear, recreation/activewear, footwear, handbags, jewelry, eyewear, a Mr Turk menswear line, and residential décor and textiles. The Mr Turk menswear line conveys a California dapper style and carries on the brand’s affection for vibrant color and print. Men who want to make a sartorial statement can now select from among jackets, shirts, pants, shorts, swimwear, ties, and bowties designed by Skow. A well-known stylist and photographer, Skow does all the photography for the Trina Turk and Mr Turk brands and also designs the distinctive men’s line. The couple split their time between two historic, restored midcentury marvels — in Los Angeles’ creative enclave of Silver Lake and in Palm Springs — interspersed with travels up and down the coastline and around the world. A favorite pastime is vintage shopping, and their educated collectors’ eyes discover inspiration in any new destination, near or far. They also share a keen passion for architectural preservation. The Trina Turk brand’s corporate headquarters, design, and production are located in Alhambra, California, east of downtown L.A. The first retail store opened in Palm Springs in 2002; the brand has has since expanded to 12 boutiques. Trina Turk signature boutiques are located in Fashion Island in Newport Beach, California; Burlingame, California; Dallas’ Highland Park Village; Atlanta’s Phipps Plaza; and The Galleria in Houston. Trina Turk | Mr Turk boutiques are located in Palm Springs, Palm Desert, Los Angeles, Manhattan Beach, Miami, New York, and Honolulu. A pop-up shop appeared for a few seasons in East Hampton, New York. 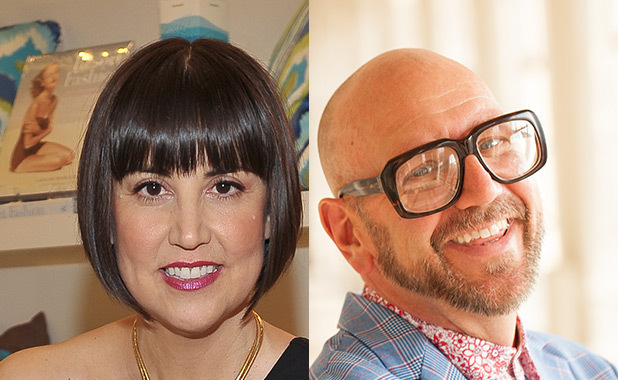 Trina Turk is an active philanthropist, giving back in each of these local communities, as well as contributing generously to arts, education, and preservation causes, among others.